With Shop'NCook recipe wizard, you can have a new recipe ready for production in seconds, complete with cost and nutritional analysis. It learns also as you use it and becomes always better at understanding your recipes. 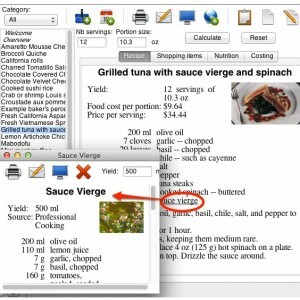 Estimate effortlessly the cost of your recipes and menus, even if you are a complete beginner. Detailed video tutorials will guide you in the arcanes of recipe costing, waste treatment, and more. Plan your meals, scale your recipes and make aisle-ordered shopping lists from your recipes and meal plans with a few clicks. Avoid food waste by getting exactly the supplies you need. Analyze the nutritional content from your recipes and create a USDA-approved nutrition facts panel with ingredient list and allergen declaration with a few clicks. 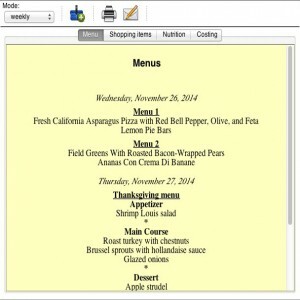 Windows and mac software, mobile apps and online services work together to facilitate your recipe management. 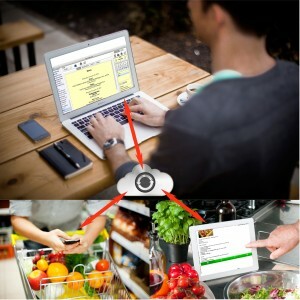 The built-in cloud synchronization keep your data synchronized among your devices. Get the best price for your supplies. Shop'NCook Pro software allows you to maintain a product database for each of your vendors and optimize the price of your shopping list among them with a click. It takes me just minutes! I just wanted to write to say that I love your product. I bought it probably two years ago, and it saves me so much time. I am a personal chef, and I was spending HOURS writing up grocery lists for my client's orders. Now it takes me just minutes. I love that! I was spending HOURS writing up grocery lists for my client's orders. Love the program!! It certainly has shown me that I am underpricing many of the things I offer! It has shown me that I am underpricing many of the things I offer! Cooking will be fun again! How well thought out this software is. Not being fluent in computerese has hampered my previous efforts in learning to use other applications. 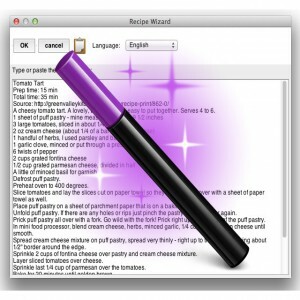 I was stunned at how fast I managed to import recipes, create a shopping list, and print it. Cooking will be fun again. 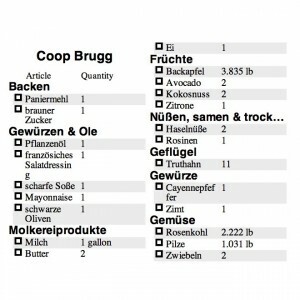 I was stunned at how fast I managed to import recipes, create a shopping list, and print it. 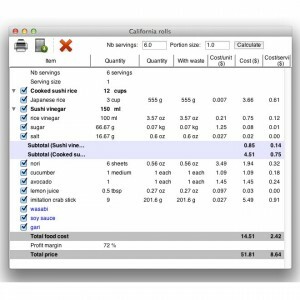 Very happy to find a convenient, easy to learn software that helps with scaling portions, costing recipes and printing nutrition labels. The forum you provide online is particularly helpful, especially the way you have made yourself available for questions. I'm excited to see the updates and appreciate your desire to continually improve your product. Cheers! 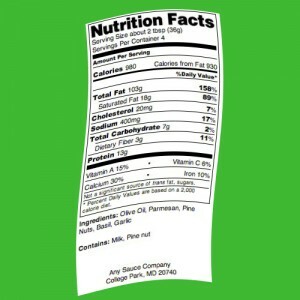 Easy to learn software that helps with scaling portions, costing recipes and printing nutrition labels. Your video and the program is wonderful. In 10 minutes I had downloaded, edited, scaled, and had taken the recipe on and off the calendar. I tried others for 3 days before I decided they were too much trouble. Yours will complete a 10 day trial and I have a feeling it's a keeper. Better by far than any shareware and even the Mac programs I have tried. Better by far than other programs I have tried! This is an amazing program! I've been looking for something exactly like Shop 'N Cook Pro for a catering company for a few months now to do costing of events and recipes, and I'm so glad I found this. They've thought of so many things that a chef or home cook might need. They've thought of so many things that a chef or home cook might need. Shop'NCook is easy to use and easy to customize for my needs. The nutrition check is one of my favorite options. I can add recipes faster with this program than others I have used. The nutrition check is one of my favorite options. We have been using Shop'NCook Pro since we started our business in April, and I honestly don't know how we would operate without it. [...] Before Shop'NCook, I did everything manually, I wasted 100's of hours and probably thousands of dollars before Shop'NCook came into my business. 5 stars! I wasted 100's of hours and probably thousands of dollars before Shop'NCook came into my business. Shop'NCook has taken my business to another level. It has helped me organize years of recipes into a practical database that does everything I need to run a successful Chef business. As I get more familiar with the software I discover that it is very detail oriented and it saves me incredible amounts of time. I am a HUGE FAN and I THANK YOU from the bottom of my heart! Shop "N Cook has taken my business to another level. This is the first recipe/shopping type program I have used that actually has most of the items I shop for in the database, and the ones not in are easily added. This is the first program I have used that actually has most of the items I shop for in the database.